Angry protesters surrounded Icelandic Prime Minister Geir Haarde's car on Wednesday, banging on the vehicle's windows and pelting it with eggs. Television footage showed Mr Haarde hurriedly getting into his car outside the government building in Reykjavik before a crowd descended on it. He managed to drive off only once his bodyguards and police pushed them away. 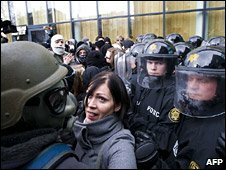 On Tuesday, police arrested 20 people at a protest demanding Mr Haarde resign over his handling of the economy. About 2,000 people attended the demonstration outside parliament in Reykjavik, in a bid to disrupt the first session of the year. Some people hammered on the windows of the parliament, the Althing, breaking several on the ground floor. Others set off smoke bombs and threw snowballs at riot police stationed outside. Chief police inspector Johann Thorisson said the force had not detained anyone after the attack on the prime minister's car on Wednesday because he had not been physically attacked. "There is still turbulence, but we are going to try and take it easy and not arrest anyone. Now they just throw snowballs, banging on drums and making noise," he told the Reuters news agency. Correspondents say protests against the government and central bank have become a regular fixture in Reykjavik since October, when Iceland's financial system collapsed in the global credit crunch. The country's currency has since plummeted, while unemployment - once close to zero - is soaring. The economy is meanwhile forecast to shrink by 9.6% this year and see no growth in 2010.